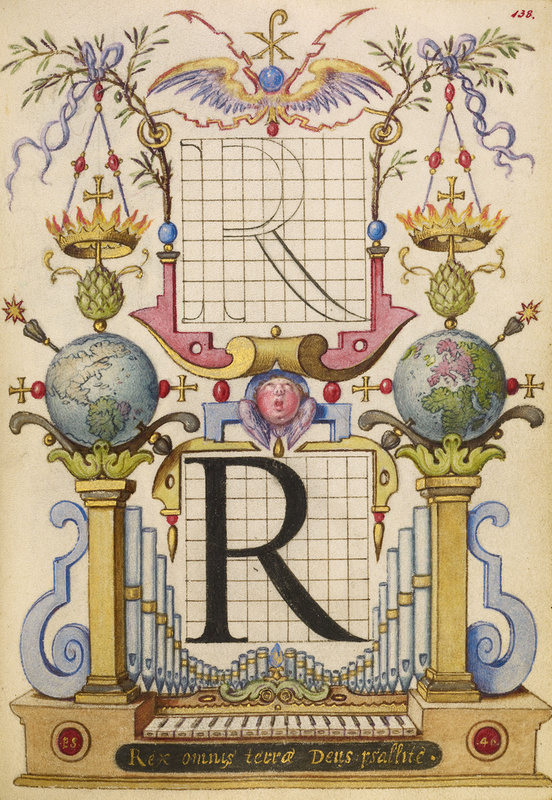 In this example of a letter Rfrom Joris Hoefnagel's constructed alphabet, the artist provides both a geometric template and a completed character on the square grids at the center of the page. The letter also introduces the phrase written in gold at the bottom of the page "Rex omnis terrae Deus psallite" (Sing praises to God, King of all the earth), which inspired the inclusion of a singing cherub at center and a pipe organ at bottom. The earth appears twice, presenting both of its hemispheres, with California visible at far left.